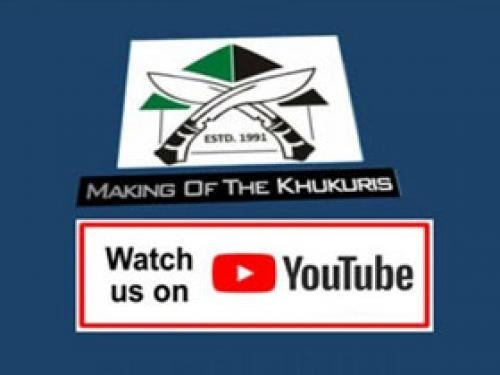 Here we have explained 13 steps in making the blade of khukuri/kukri. Surplus Indian truck steel (suspension leaf spring; HC) are bought from local scrap shops/dealers after carefully observing for any cracks or puncture and then transported to KHHI factory located in Patan Industrial Estate in Lagankhel. It is stored with other raw materials in the warehouse. The steel is then weighed to make the required type of khukuri. 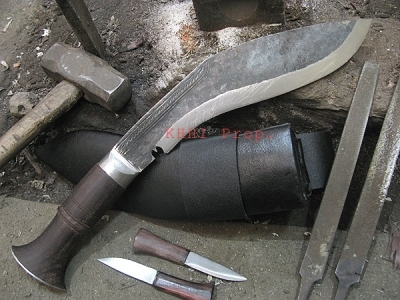 The weight of the steel should be slightly heavier than the actual (final) weight of khukuri as weight is lost in grinding process when shaping it. The steel is measured depending on the total length required for the khukuri. Normally around 1/2 of the required size is measured on the steel. But this depends on the thickness of the steel; longer if thinner and shorter if thicker. The measured steel is cut and split from the main body. At first the steel is red heated around 800-900*C in a charcoal oven, “Chula”, and then is hammered using 3 kg hammer against a sharp metal cutting Chisel. This hammering process takes almost half an hour for two men to break the steel apart. This is the most important stage of the making process. Here the kukri gets a rough initial shape and size and also the tang is forged out from the steel. The forging (this stage) is all about the master craftsman who rolls around the steel side-by-side, up and down and back and forth while being beaten by two 3 kg hammers simultaneously by his associates. The steel is red heated regularly and hammered countless time to bring into the required size, shape and structure of the kukri. During the process the steel gets the re-curve shape of a khukuri and the tang is created where handle will be fixed at later stages. This heavy duty work takes about an hour for the 3 men team/set. The rough shape formed at the earlier stage at forging is now given the actual shape. The master craftsman uses 1.5 kg hammer to bring the rough shape to real. The still is regularly heated, beaten all around the surface over and over to get the required shape. This is a very time consuming stage and requires a lot of skill and years of experience. After the shape is achieved notch (blood dripper) is made at the ricasso of the blade. A rod having its tip like the shape of a notch is used and carefully hammered in the area. The blade is once again heated, made soft and the rod is hammered in so that it cuts the edge of the blade and leaves the impression of notch. Thus notch is later finalized by using a 5” Pitsaw file. Making of the pattern above the notch along the spine takes place in this stage. 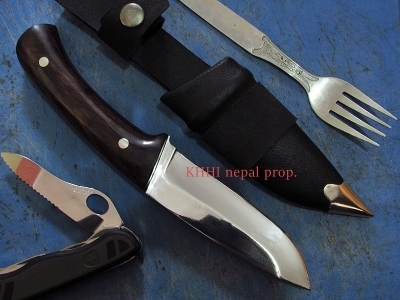 Various patterns are made depending on the type of khukuri. A sharp pointed Chisel and 1 kg hammer are used to make the patterns. The craftsman maneuvers his toes to move and flip the blade to find the right spot to hammer in the patterns. In some village khukuris brass inlay is used as part of the decoration of the pattern. This is another crucial stage where the blade is given hardness and strength. The craftsman carefully spills water (at room temperature) onto the edge/bevel of the carefully heated blade. It requires great skill to be able to judge the right temperature by the sheer color of the blade in order to get the best quench (hardness). The blade’s bevel must be equally heated at the same temperature just before the quenching. Over/under doing it will result in inferior quality either resulting in cracks or subtle (weak) edge. Also, the amount of water spilled should be well balanced on all parts and should not be done on the panel of the blade. In this stage, the coarse blade is filed by a 10” flat rough file and finished (smoothened). A pair of pliers is used to hold the blade and the file is scrub against the blade countless times until it becomes well done. The blade’s counters and corners are leveled from all angles and sides. The craftsman pays special attention to the edge of the blade and makes it thin and steep from both sides. Here blade is joined/fixed to the handle. A hole is first drilled into the solid handle material by a 10mm drill machine. Then the tang is red heated and inserted into the same hole which burns the handle material and leaves a trail of smoke. Traditional laha glue is pressed and squeezed inside the hole and filled up. Then the tang I inserted into the hole and secured to the handle. A very traditional method is performed to sharpen a khukuri. It is obviously very time consuming but effective. It requires two persons and a homemade wheel-chain rotary appliance to complete the act. The device uses a 10-12” hard wheel made from the mixture of laha, fine sand and tiny particles of white river stones. The mixture is cooked and stirred for several hours until it is perfectly blended to each other. Then it is spilled in a round iron frame and dried up until it is rock hard. The craftsman grinds the edge of the khukuri against the wheel on both sides to trim the bevel and sharpen the edge while his associate pulls the chain to spin the wheel from the other side. Water is regularly poured on the edge to calm the temperature generated from the friction. The edge is checked time and again until it is very sharp. During this traditional sharpening process the edge of the blade is repeatedly checked over and over in order to get required sharpness. The craftsman regularly deeps the blade into water and also spills fine sand particles over the edge and again grinds in the sharpening wheel. Here water controls the heat generated from grinding and makes sure hardness is not withdrawn from the edge where as fine san particles helps to trim down the edge smoothly. This is the last stage of the making in which the khukuri is finished and polished (shinned) skillfully. The blade and handle both are finished by applying various grits of sand blasters and papers (lower to higher). The finisher uses 2-3 HP Buff Machine and does 4-5 sets of various steps to get the fine finishing. He has to be very cautious not to overdo the job as overheating may ruin the hardness of the blade making it soft and fragile. ​Water buffalo horns are imported from India and transported to factory in large number. They all go through the selection phase and bad quality horns are rejected. The hollow area of the horn is cut off from the main body and only the solid part is used to make handle. The solid horn is then measured to fit the size of a required khukuri. Now the making of a handle starts. The horn is now brought into the shape of a khukuri handle. The craftsman uses another sharp khukuri and modifies the raw horn into curve, oval or round shape to fit the handle of a khukuri. During the process, gaps are also made for brass fitting to stay at the two ends of the horn. Now brass fittings are cut to support the handle. The exact size of the two ends of the handle are measured and cut to fit the brass cap at the rear portion ( Chapri) and the brass holder at the other end ( Kazo). Brass fittings are also filed to make it smooth and shiny. The cut pieces of brass are given shapes and sizes according to the khukuri. The two-ends of the brass is fairly heated and are pressed onto one another and repeatedly hammered until they attach and join together. Then the brass frame is again hammered from all angles to every corner to achieve the required shape. Glue taken out from the bark of trees (Laha) is used to join the blade with the handle. Before this, a hole is drilled through the horn for the tang of the blade to go through. Then the Laha is fairly heated and as it starts melting, it is squeezed inside the hole by the tang as shown in the picture. The craftsman makes sure that no gaps are left inside the horn as it is important for Laha to firmly stick around the blade for strong grip. As depicted in the picture, brass cap and brass holder is used to lock the khukuri to its handle. The brass fittings, which are placed onto the grooves made on the edges of the handle, lock the khukuri to its hilt. It is then made secure using laha/glue. The extra portion of the tang is then cut on the edge of the brass cap and sealed using a brass rivet. A file is used to filing the handle to make the surface smooth. All the rough pop outs while shaping the horn is scratched off from the handle and given clean-level surface. In this stage, a sharp wire is also used to rub against the handle to and fro to make deep lines for better grip and look. The water buffalo hide is submerged into water for sometime until it becomes completely wet and fairly soft. It is then scratched with a sharp slicker to remove all the remaining waste attached in the hide. Later, it is cut into the size required for a khukuri scabbard. A wood called 'Sisau' or 'Karma' in English is used to make khukuri scabbard. The wood is roughly cut to give pointed and curved shape as in the picture. The craftsman is careful not to cut the wood too deep to avoid from becoming thin and weak, as a result. Now the roughly cut wood is resized to make the exact size of a khukuri scabbard. 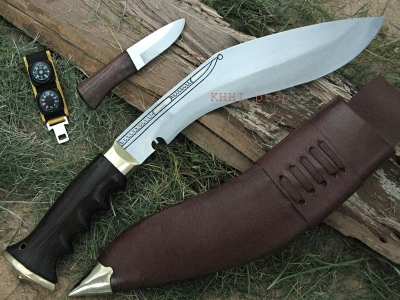 A khukuri is used to measure the size needed for its own scabbard. During the process, craftsman cuts ¼ inch wider than actual size so that it becomes easier to tuck in and out the blade from the wood. During this process, the wood is scrapped and made hallow for the blade to fit in. Inside of the wood are sliced off from the main body so that a room is created for the blade. It is important not to over do it so that the blade does not wiggle around when tucked in. While scrapping the wood inside, rough wall (obstruction) like structure is made around the outer portion so that the blade stays firmly when kept inside. Now the wooden frame is filed from outside and made smoother. The rough surface of the wood is scratch off to make smooth and to level its surface. This will later help the hide to stay in balance and firmly with the wood. The completed wooden scabbard frame is now wrapped with the earlier treated hide. Two rounded belt leather stripes are also attached at the top of the frame. A different kind of hard leather is used for this purpose in order to fit in two small knives called the 'Karda' and 'Chakmak'. Now the wrapped hide is strongly sewn using a needle and thread. The craftsman uses both his hands and feet to stitch the hide around the frame. Note that in the picture, feet are used to press the hide against the wood and hands used to sew the hide. The process is repeated back and fourth for much better grip.